MILLEDGEVILLE, Ga. – A prosthetic leg, an arrow-pierced crow, and a burning cross are among the ink drawings that will be on display for a seven-month run at Andalusia Farm. “Covering Flannery: Book Design and Visual Narrative” will be on view from February 5 through September 3, 2017 at the farm on U.S. 441, four miles north of downtown Milledgeville. The exhibition features studies for new covers for O’Connor’s most well-known volumes of fiction. The work offers visitors a glimpse of the ways in which art work becomes marketable book covers through collaboration between artist and graphic designer along with the third collaborator…the stories. 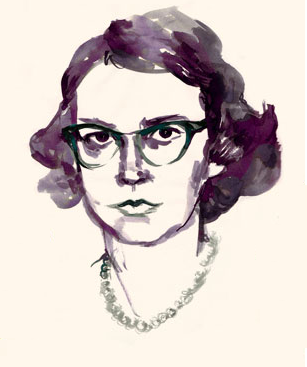 “These gorgeous ink studies plumb the depths of Flannery’s sometimes dark and often humorous fiction.” said Elizabeth Wylie, executive director of the Flannery O’Connor-Andalusia Foundation, which operates the farm where the author wrote most of the work that established her as one of the world’s foremost 20th Century writers. June Glasson (Laramie, WY) and Charlotte Strick (NYC) will focus on the design process as they sought to bring O’Connor’s work to visual life. Shannon Skelton (Milledgeville, GA) will explore O’Connor’s creative process as evidenced by the novel, and she will read from her own work. Candice Dyer (Cleveland, GA) and a North Georgia industry professional will share information about the history of moonshine making and distribution and connect it to the novel in which moonshine figures prominently. Covering Flannery is a collaboration between Mark Sellers, Charlotte Strick and June Glasson. February Four 2017 has been guest curated by Monica Miller. The combined projects have been supported in part by The Flannery O’Connor Review at Georgia College. Cover design by Charlotte Strick. Cover art by June Glasson. Reprinted by permission of Farrar, Straus and Giroux, LLC. Glasson and Strick are available for interview February 4 and 5, 2017. Wylie, Sellers, Miller and O’Connor Scholar and FOCA Board member Bruce Gentry are also available for interview. 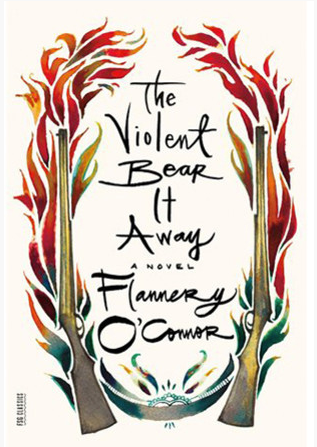 Photo of book cover for “The Violent Bear it Away”: Cover design by Charlotte Strick. Cover art by June Glasson, Courtesy Farrar, Straus and Giroux, LLC. Portrait of O’Connor: Courtesy of Farrar, Straus and Giroux, art by June Glasson.